We are at a critical juncture in world politics. Nuclear strategy and policy have risen to the top of the global policy agenda, and issues ranging from a nuclear Iran to the global zero movement are generating sharp debate. The historical origins of our contemporary nuclear world are deeply consequential for contemporary policy, but it is crucial that decisions are made on the basis of fact rather than myth and misapprehension. In Nuclear Statecraft, Francis J. Gavin challenges key elements of the widely accepted narrative about the history of the atomic age and the consequences of the nuclear revolution.On the basis of recently declassified documents, Gavin reassesses the strategy of flexible response, the influence of nuclear weapons during the Berlin Crisis, the origins of and motivations for U.S. nuclear nonproliferation policy, and how to assess the nuclear dangers we face today. In case after case, he finds that we know far less than we think we do about our nuclear history. Archival evidence makes it clear that decision makers were more concerned about underlying geopolitical questions than about the strategic dynamic between two nuclear superpowers.Gavin's rigorous historical work not only tells us what happened in the past but also offers a powerful tool to explain how nuclear weapons influence international relations. Nuclear Statecraft provides a solid foundation for future policymaking. "Nuclear Statecraft is a provocative and fascinating book. The writing is lucid, the analysis tightly woven and sophisticated, and the book's core conclusion-that much of what is said and thought about nuclear policy today remains hobbled by a pervasive ignorance of history (even, or perhaps especially, among nuclear policy experts)-is well argued and compelling. This book makes a significant contribution to the body of scholarly research about the evolution of US nuclear policy." "Francis J. Gavin's elegant and eloquently argued Nuclear Statecraft is a useful and timely reminder to appreciate better the historical origins of the contemporary nuclear world.. [The] section dealing with Gavin's debunking of the four myths on which nuclear alarmism is grounded-rogue states, tipping points, nuclear terrorism, and the so-called Long Peace-is worth the book's price and should be compulsory reading for decision makers and policy practitioners everywhere. 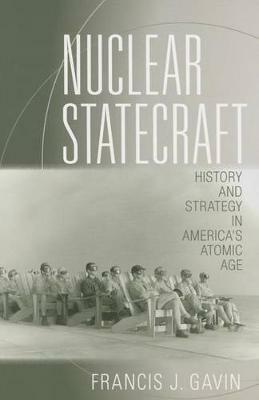 Nuclear Statecraft is a must acquisition for academic and public libraries." "Gavin not only succeeds in disentangling postwar nuclear history from the US-Soviet rivalry of the Cold War, but provides a deeper and more complex understanding of the long-term effects of nuclear weapons on Great Power relations." "Gavin's project is not merely to set the rest of us straight on nuclear history so that we can 'get it right.' Rather, it is to point out that the most useful insights to nuclear weapon issues are likely found at the convergence of nuclear theory, policy, and history, with the additional caution that even a firm grasp of the former two does not imply an equally firm grasp of the latter.... To each related theory and policy discussion he imparts a useful perspective concerning both the neglect and misuse of historical data." "Francis J. Gavin has mined recently declassified documents to produce a first-rate book on how nuclear weapons influenced the course of the Cold War. He challenges a number of well-established beliefs about that nuclear history in sophisticated and interesting ways, and makes a compelling case that it is important to understand that history correctly, because the nuclear challenges of the twenty-first century are not all that different from those of the Cold War. This book should be read by all serious students of international affairs, but especially those who think about how nuclear weapons affect international politics." "How do nuclear weapons affect the way international politics works? The question is extraordinarily important, and how we answer it can have a profound effect on how we think-or should think-about basic issues of policy. In Nuclear Statecraft, Francis J. Gavin not only shows what is wrong with the way that issue has been dealt with but also shows how much insight-that is, fresh insight-one can get into these problems by bringing the method and sensibility of the professional historian to bear. His historical analysis breaks new ground in all kinds of ways: many of Gavin's points will force you to rethink what you thought you knew about nuclear issues. This is a stimulating, thoughtful, and rather unconventional book--the kind of book anyone with a serious interest in nuclear issues should read." "In this provocative reassessment of post-World War II international history, Francis J. Gavin uses new archival materials to help us understand our nuclear past-not for its own sake, but to empower us to think more analytically about the pros and cons of outlawing nuclear weapons or taking preemptive action against potential proliferators, like Iran. This is an incredibly timely book that will stir argumentation and catalyze creative thinking." "This book will be a game-changer for the field of security studies. Francis J. Gavin's masterful, sweeping analysis demolishes the myth that U.S. nuclear weapons policy has ever followed the deductive logic of rational deterrence theory. Nuclear Statecraft convincingly shows that whether nuclear weapons enhance, imperil, or are irrelevant to international stability depends heavily on the ideas and behavior of the flesh-and-blood leaders who control them."